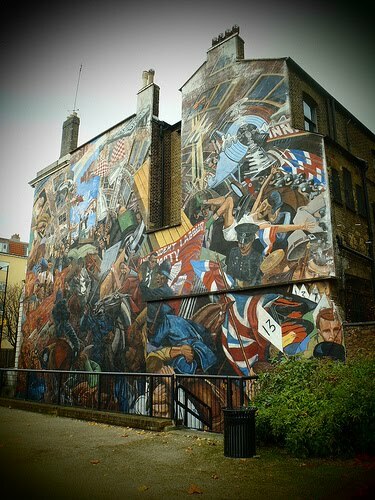 Completed in October 1982, the Cable Street Mural recalls the infamous 1936 Battle of Cable Street, which saw a clash between Oswald Mosley's British Union of Fascists, and a range of local and anti-fascist groups, which included local Jewish, socialist, anarchist, Irish and communist organisations. The Fascists were famously blocked from marching through Cable Street in Stepney, then mainly a Jewish area. The mural is painted on the side of St George's Town Hall, which has been in the past the Town Hall for Stepney and a local Vestry Hall. The mural was intended to mark the famous victory by the people of the East End, but was attacked during its creation in 1980 when fascists daubed it with the words 'British Nationalism not Communism - Rights for Whites. Stop the Race War' in six foot high letters. The mural is amazing and does actually look Deco. I realise the event it memorialises happened in 1936, not the painting of the mural. Yes Hels, but it's worth remembering that the vast majority of people are tolerant and nice. The battle of cable street site gives an incorrect account of the painting of the mural and it has not been possible to contact anyone to change it. Paul Butler was one of the painters of the mural and we are looking to find ways of providing a better account of the painting of the mural which sadly is in desperate need of repair if it is to survive the winter.